The crisis of borders and prisons can be seen starkly in statistics. In 2011 some 1,500 migrants died trying to enter Europe, and the United States deported nearly 400,000 and imprisoned some 2.3 million people--more than at any other time in history. International borders are increasingly militarized places embedded within domestic policing and imprisonment and entwined with expanding prison-industrial complexes. 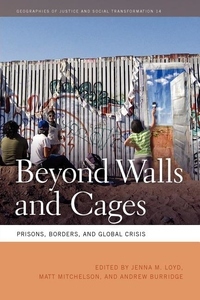 Beyond Walls and Cages offers scholarly and activist perspectives on these issues and explores how the international community can move toward a more humane future.Working at a range of geographic scales and locations, contributors examine concrete and ideological connections among prisons, migration policing and detention, border fortification, and militarization. They challenge the idea that prisons and borders create safety, security, and order, showing that they can be forms of coercive mobility that separate loved ones, disempower communities, and increase shared harms of poverty. Walls and cages can also fortify wealth and power inequalities, racism, and gender and sexual oppression.As governments increasingly rely on criminalization and violent measures of exclusion and containment, strategies for achieving change are essential. Beyond Walls and Cages develops abolitionist, no borders, and decolonial analyses and methods for social change, showing how seemingly disconnected forms of state violence are interconnected. Creating a more just and free world--whether in the Mexico-U.S. borderlands, the Morocco-Spain region, South Africa, Montana, or Philadelphia--requires that people who are most affected become central to building alternatives to global crosscurrents of criminalization and militarization.